136 pages | 34 B/W Illus. The lifeblood of any business is the timely delivery of products and services. In the best possible world, if one plans accordingly, disruptions never occur. However, in the real world, disruptions do and will occur and the best business plans are those that anticipate and prepare for this inevitability, especially when dealing with international suppliers. Supply Chain Risk Management: Minimizing Disruptions in Global Sourcing provides a detailed road map for the efficient delivery of products and services, while taking into account the high probability of costly delays and stoppages. 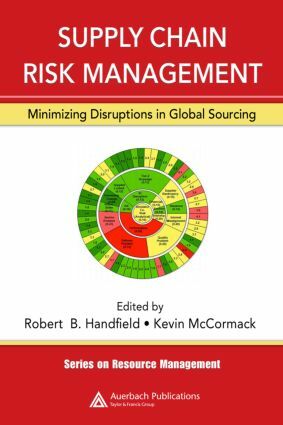 With candid input from suppliers, automotive and retail companies, and professional consultants, this work delivers a pragmatic approach to managing supply chain risk in an era of globalization. All executives and managers share a common goal of reducing costs, streamlining processes and increasing profits. Within these pages, you will discover a winning game plan for efficiently navigating the complexities of supply chain risk in today’s global marketplace.